When Labor Day Weekend rolled around this year, I knew that I wanted to make a cobbler. Cobblers are one of my favorite desserts, and I love that they are always so different depending on the fruit that you use. 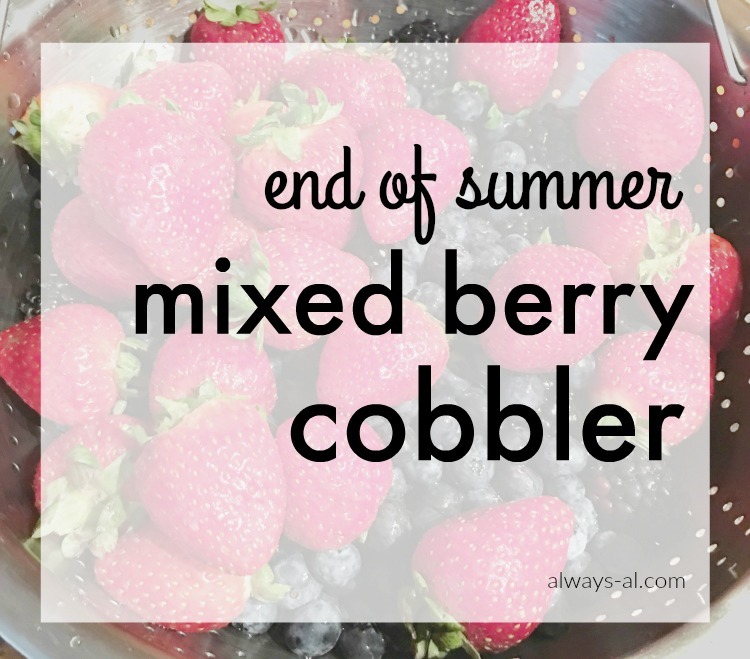 I bought some fresh berries at the store, and decided that I would make a mixed berry cobbler to enjoy at our Labor Day picnic. This recipe originated at Bake or Break. Jennifer has a HUGE collection of breads, desserts and other treats that all just seem so delicious. Now that I have my very own Kitchen Aid Mixer, I am so excited to try out some more baked goods. -Preheat oven to 375°F. Grease a 9”x 6” rectangular or 8” round baking dish. (I used a 8"x 8" square pan. -Place the berries in prepared pan. Drizzle with lemon juice. This is where you can add in some lemon zest for a very fresh flavor. -Whisk together the flour, baking powder, and salt. -In a medium bowl, beat the butter, brown sugar, and vanilla until well-blended. Mix in the dry ingredients until mixture resembles crumbs. Drop the dough crumbs evenly on top of the berry mixture. -Bake for about 30 minutes, or until the top is golden and the fruit is bubbling. This is delicious when served with a scoop of vanilla ice cream, or a nice dollop of whipped cream. It makes a wonderful, fresh dessert (or breakfast, if you are me), for the end of summer.